In my Tobias-inspired post, Your Are Not Your Audience, I talked about how the general public (our target audience) responds to relative measurements. Of course, we see what we consider to be the best. But the general public just sees things that are worse (beef, sheep), and things that are better (pork, chicken, eggs). Given that any switch from big animals to small leads to much more suffering, we simply can't afford to offer any argument that even might lead people switch to eating birds. Thanks. 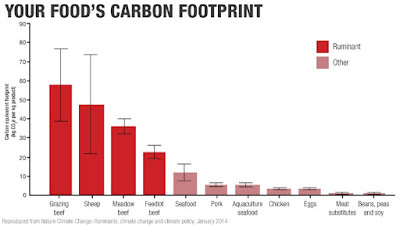 Regarding the heading 'Carbon Footprint,' what is carbon's relationship to methane? I was under the impression that it is methane that is the big issue in animal farming, particularly the ruminants. Methane is CH4, while carbon dioxide is CO2. Methane is a more potent greenhouse gas, but shorter lived in the atmosphere. Carbon footprints are calculated in terms of CO2 equivalents. What time frame is used for the equivalence calculation? If I recall correctly a century is/was the norm, but a decade may be better, as that is closer to the time frame for global warming. Under the century based calculations, methane is not near as bad, since it will be mostly diminished in a century.